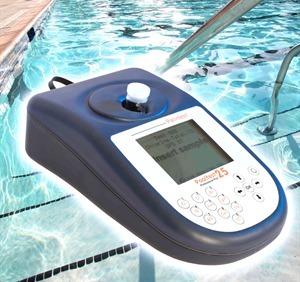 Professional pool testing for use poolside or in a retail environment, the Pooltest 25 Professional Plus delivers complete pool testing in an easy-to-use photometer. Swimming pool testing can take many forms from simple visual products to sophisticated yet intuitive electronic instruments. 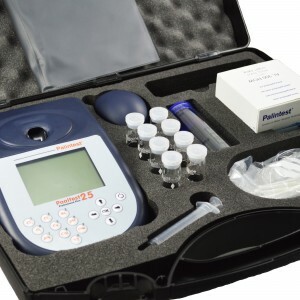 Professional pool testing should always be carried out with a photometer and the Pooltest 25 Professional Plus is the choice of major international events such as Beijing 2008 and London 2012. USB port for download of 1,000 results with date, time and sample ID. Suitable for use anywhere, the USB port is bi-directional allowing data download without any specialist software required and remote control via proprietary pool software programmes. Delivered with all components required to start work immediately and supplied with a two year warranty, the Pooltest 25 Professional Plus is the choice of professionals.